Get up close and personal with gators at East Texas Zoo & Gator Park! East Texas is well known for its abundant wildlife, especially the often misunderstood alligator. But there’s one place where you can get up close and personal with gators: East Texas Zoo & Gator Park! Sure, they have dozens of alligators, from hatchlings all the way up to 14 feet long. And the enclosures in the park are designed to be as close to their natural habitat (and you!) as possible. But there’s so much more! East Texas Zoo also features primates big and small, as well as exotic cats, lemurs, birds, and all sorts of other critters! The lobby is full of fish, snakes, turtles, lizards, and ferrets. The duck and swan pond is right between two covered pavilions and is the perfect spot for a relaxing picnic. The zoo also features a barnyard, a baby room for visiting the newborn animals, and an air conditioned welcome center and gift shop. They even have a concession stand and dining room where you can enjoy your meal indoors. The zoo hosts school field trips, church groups, and other organizations, with educational tours for all ages, and it’s available after hours for special events! 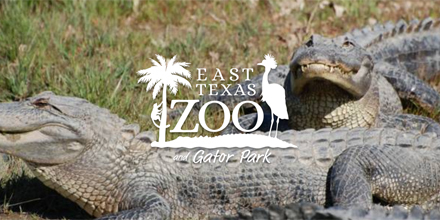 East Texas Zoo & Gator Park is located near Grand Saline, Texas and is open daily from 9:00 a.m. to 5:00 p.m. Admission is $8 per person, but children two and under are free. Don’t miss it!